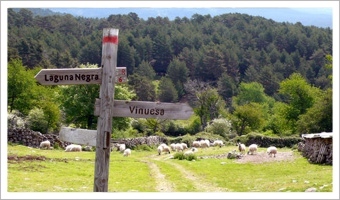 The region of Pinares in Burgos and Soria that strechts out to the Picos de Urbión is an example of a green space with a wide forest managament tradition and a population closely attached to its forests. The exploitation of these mountains and the transformation of its products has been for centuries the base of its economy, has helped to create its identity and the traditions that are transmitted year after year. The forest of Urbión is the most extensive forest mass of the Iberian peninsula, including more than 100,000 ha. between the Burgos and Soria provinces (15 municipalities in Burgos and 20 in Soria). Although wild pine or albar (Pinus sylvestris) is the most frequent and emblematic tree of the region, exceptional protagonist of a long tradition of uses and a particular idiosyncrasy of the area’s inhabitants, other trees such as Pinus pinaster, Pinus nigra, Fagus sylvatica, Juniperus thurifera, Quercus pyrenaica or Quercus faginea can be observed, besides innumerable small trees such as maples, holly trees, willows, etc. High mountain pastures and their glacial cirques where tarns and peaty zones appear are areas of great ecological and landscape value. In this area can be found different protected natural spaces (Nature Reserve of the Canyon of River Lobos, Natural Reserves of Sierra of Urbión and Sierra of Demanda, Natural Reserve of Sabinar of Calatañazor) and protected places (Natural spaces of Sabinar de La Yecla and La Fuentona, ZEPA Sierra de la Demanda and Sierra de Urbión and LIC Sierra de la Demanda, Sierra de Urbión and Cebolleras, Banks of the River Duero and its affluents), where a huge variety of representative especies of the regional ecosystems live. In the last years, wood has been the product of highest value. Its production has been promoted and nowadays, its use plays an essential role. However, social use, hunting, mushroom harvest or the environmental use are the ones that are growing considerably and the most important to the eyes of society. Managament refers to the group of actions of all kinds carried out in these mountains in order to guarantee an acceptable balance between the manufacture of goods and the provision of services. This managament has obtained the seal PEFC for sustainable forest management. In the publication "El Mercado Natural de Empleo Tierra de Pinares Burgos-Soria" ("The Natural Market Of Employment in Pinares Burgos-Soria") the area is described as an area that exceeds the administration level of the province but also as an area that has as one of its most representative characteristics its unity and geographic singularity, something that is shown not only in its physical aspects but also in the historical and demographic characteristics (customs of the people) and because of a significant element that distinguishes and differentiates it from the rest of the province, that is, the organization and exploitation of its mountains. The inhabitants of the region have learned to live from and for the mountain. The industry dedicated to wood transformation has become the real economic driving force of the area. Forest exploitation, mountains’ regulation and timber factories conform the main economic base of this region, with important upturns in the last years in mycology and rural tourism. Cattle raising activities, hostile to forests in many places, are perfectly integrated here.